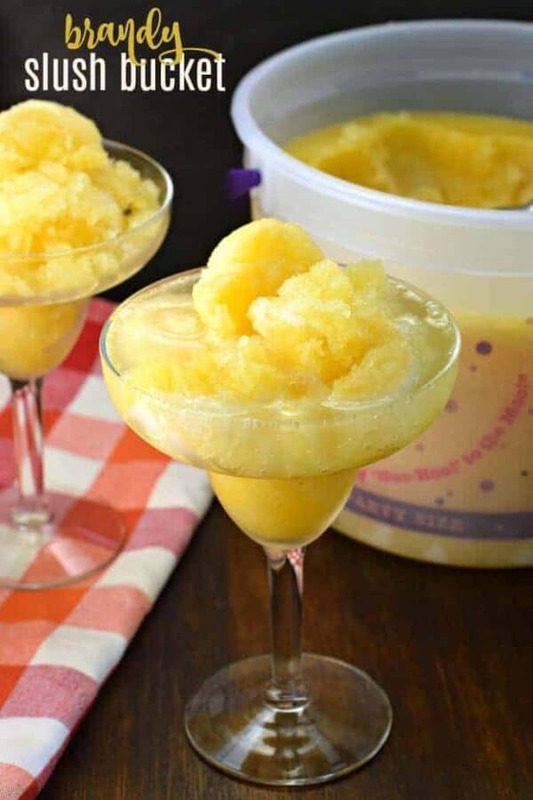 This sweet and boozy Brandy Slush is the perfect drink to make in advance and keep it frozen until ready to serve! I am going to apologize in advance. 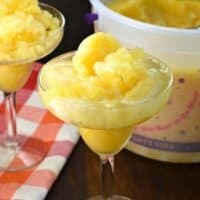 I’ve had this easy Brandy Slush bucket recipe for about 15 years and I’ve never shared it here on the blog. Why? Cause I forgot about it! Back in the day…the early days of marriage…I used to whip up this Brandy Slush (although often times we used Whiskey and called it a Whiskey Slush) and I would keep it in my freezer. We would pull it out on weekends or if company came over! Occasionally we even brought it to BBQ’s and potlucks! Everyone raved how delicious it was and wanted the recipe. Eventually we moved and became real adults drinking wine, forgetting about our delicious Brandy Slush recipe. Last week I had some girlfriends over and my friend who is a Tastefully Simple consultant offered to bring a “slush bucket” over…that totally cued up my memories and I immediately ran to the store to purchase everything I needed. VERDICT: my adult friends LOVED this just as much as we did “back in the day”! First step…eat an entire gallon of ice cream. I know. I’m asking a lot here…but it’s got to be done! 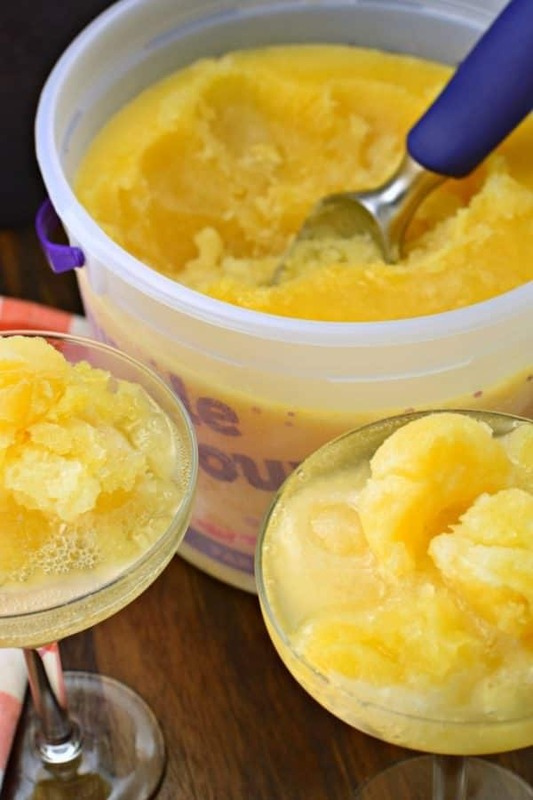 You need that empty ice cream tub to make this slush. Not any tupperware bowl will do, haha (actually it would), it MUST be an ice cream tub (actually any freezer safe bowl and lid will do…but it’s more fun eating ice cream)! SECOND…if you have children, make sure they are aware this has alcohol. Somehow label it or put it in the back of the freezer out of sight (especially important if you have teens, haha)! Think of all the flavor possibilities as you make this slush. Try it my way the first time….then go crazy. Buy pink lemonade. Or frozen grape juice. Or cranberry juice. Seriously there are so many options! This takes about 24 hours to freeze completely. I like to put it in the glass then pour the Sprite over the top. If you use a deeper glass than what I show (like a highball glass, or water glass), use your straw to mix it a little bit to make it slush like! You’re welcome! ENJOY! In a small saucepan, combine 2 cups of the water with the granulated sugar. Heat over medium high heat and whisk until the sugar is dissolved (making a simple syrup). Set aside. 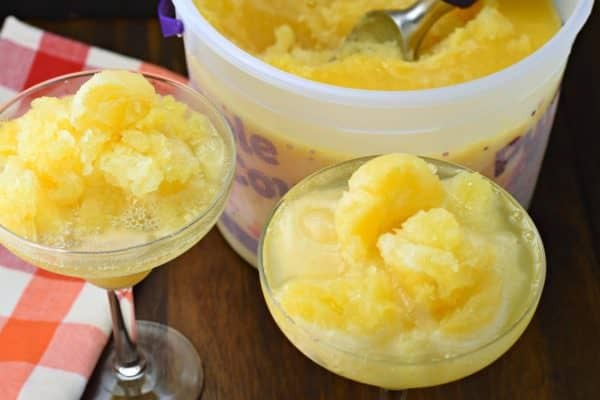 In a gallon sized ice cream pail (or similar sized freezer safe container), combine the thawed orange juice and lemonade with the Brandy and Peach Schnapps. Mix well and add the remaining 7 cups of water. Pour in the simple syrup you made. Cover and freeze for 24 hours. 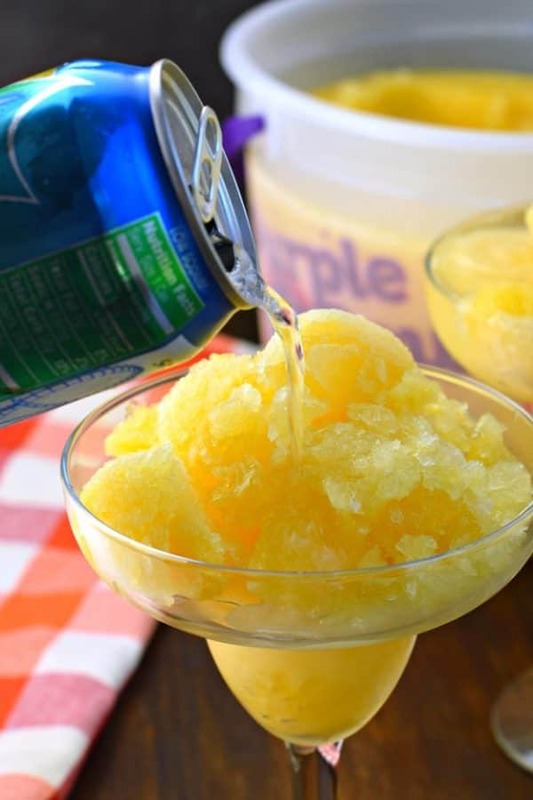 To serve, using an ice cream scoop, scrape slush into a glass. Top with lemon lime pop and enjoy! 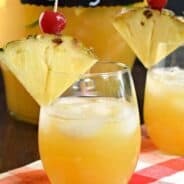 This looks like a great summertime and BBQ drink! I bet this is insanely good and refreshing! 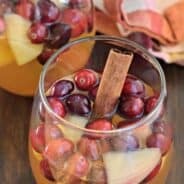 My grandma used to make something similar to this that involved an ice cream bucket, sugar, and booze! Oh wow!!! This is such a great idea for the 4th of july!! YUM!! Do you think would be ok with sparkling water/club soda instead of lemon/lime soda? After looking at the ingredients, I can’t imagine it needing to be sweeter… I’m not a super sweet beverage kind of gal. But I am a COLD SLUSHY on a HOT day kind of gal!! YUM! Sparkling water or club soda would be GREAT with this!! Great recipe, easy. I can not wait to do it! Perfect refreshment for the heat wave we have here 🙂 Thank you so much ! I love this. 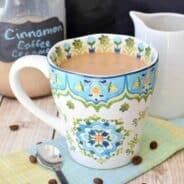 Thank you for sharing yet another awesome treat recipe. I just made my 3rd batch, my husband loves it. We like to serve it with 50/50.